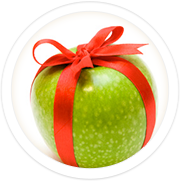 Give a gift of healthy living to your family and friends, coworkers and clients! You can save up to 50% when buying discounted gift cards for your friends, family, clients, or coworkers. You can also use these gift cards to connect with the recipients via the MyNetDiary Community. As a perk, you will receive 1 additional month of Maximum membership after every gift card purchase! Once sent to the recipient, the gift card code contains all the necessary information for a streamlined sign-up. We will require no payment from the recipient. 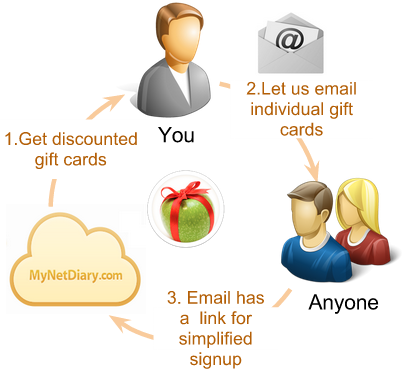 MyNetDiary can email each gift card code on your behalf, along with a special sign-up link to join your Community group. 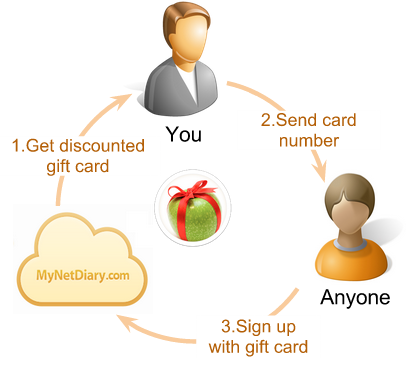 If the recipient is already a MyNetDiary member, the gift card can be used to prolong their existing membership. When you choose to connect with people in a Community group, they will be able to see overall group progress and individual reports, as well as share food definitions and exchange group messages. If you wish, you can make every recipient your Community friend, which allows complete sharing of diary information and private messaging. We hope you enjoy the discounts! Do you have MyNetDiary account? You can join members who use your gift cards into your community group or make them your friends and let them share their food diary with you. Maximum user gets 1 additional month of Maximum membership after every gift card purchase. Maximum user can also buy an individual card with discount for a friend or family member. 1 2 3 4 5 6 7 8 9 10 11 12 13 14 15 16 17 18 19 20 21 22 23 24 25 26 27 28 29 30 Tip: you save 50% when you buy more cards or choose longer period. Please provide the email addresses for the people you want to receive and use the gift cards. After you complete the purchase, MyNetDiary will send the recipients an email explaining how to redeem their gift card. Your confirmation email will include a complete list of gift card codes and the email addresses you provided.